Visit GaiamTV.com for Online Streaming Videos! Sitting exercises can be done either in a chair (with or without arms) or with a Balance Ball. These can be done at home or in the office. Some of the workouts shown below can be a great way to get started working out right in your chair. 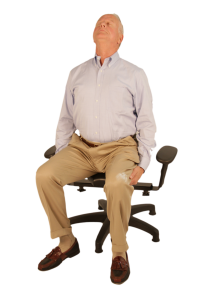 Many of the exercises are part of the Pettibon system, which uses a special Wobble Chair or Seat. Folding forward and rolling back upright. Tilting side to side with arms in the air. Tilting side to side with arms down at sides. Tilting head side to side with hands under chin. Tilting side to side with hands on each side of head. Turning head side to side with hands under chin. Tilting hips back and forth; then side to side. Move hips in a figure 8 with a 'stop' at each corner. Move hips in a circular fashion in each direction. ©FAVOSITY 2013, ALL RIGHTS RESERVED.